The school uniforms debate is not new; administrators have been debating about school uniform pros and cons for years. However the issue is not clear-cut, as there are strong cases on both sides. Should schools have uniforms? As we explore the answers to this question, keep in mind that there is no “one size fits all” approach. There is also anecdotal evidence supporting the claim that school uniforms lead to improvements in discipline and attendance, allowing students and faculty to focus more on scholastic matters (Sowell & Russel, The Relationship Between School Uniforms, Attendance and Discipline, ProQuest LLC, 2012). Not everyone involved in the debate feel that school uniforms are beneficial. Those who oppose school uniforms say that enforcing a dress code stunts freedom of expression and individuality. While uniforms may help limit bullying within a school, they can also cause bullying by students from other schools. Furthermore, opponents argue that being told exactly what to wear does not reflect the way things work in the real world, whereas schools are supposed to be a place where real life skills and knowledge are cultivated (“More Public Schools Try Out Student Uniforms,” The Boston Globe, February 20, 2014). Should schools have uniforms? Since both sides of the debate present strong cases, is there a happy medium? One possible solution is to enforce a partial dress code as opposed to a complete school uniform. This approach would promote both an environment for learning and freedom of expression. On the other hand, a dress code may be harder to enforce as students tend to blur the lines, forcing teachers to spend more time on discipline than on academics. The school uniforms debate leaves us with tough decisions to make, decisions which require careful thought and research. 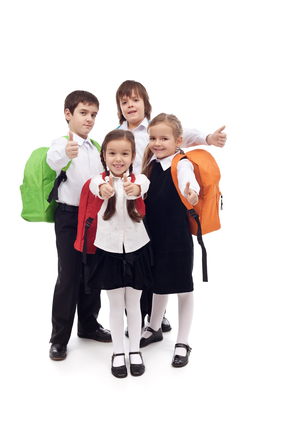 After considering school uniform pros and cons, many schools have opted in. While no consensus has been reached on the issue, it appears that more and more educational institutions are moving towards requiring uniforms. Only time will tell if the benefits of school uniforms truly outweigh the risks.